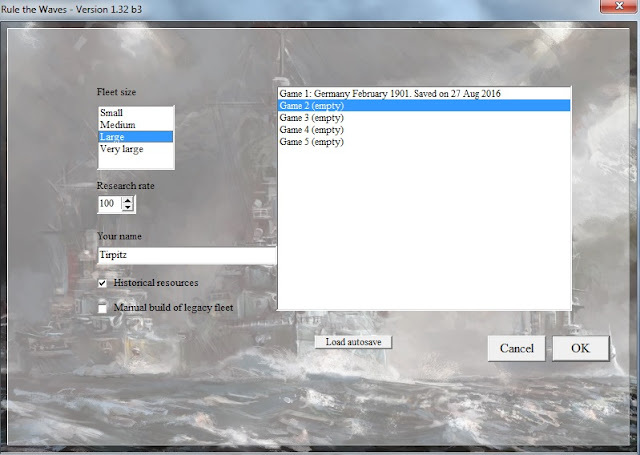 Okay, I played Steam and Iron with the campaign expansion, and I thought that anything a warship enthusiast could want was in it. Boy, was I wrong. I think I just saw a kitchen sink float by. 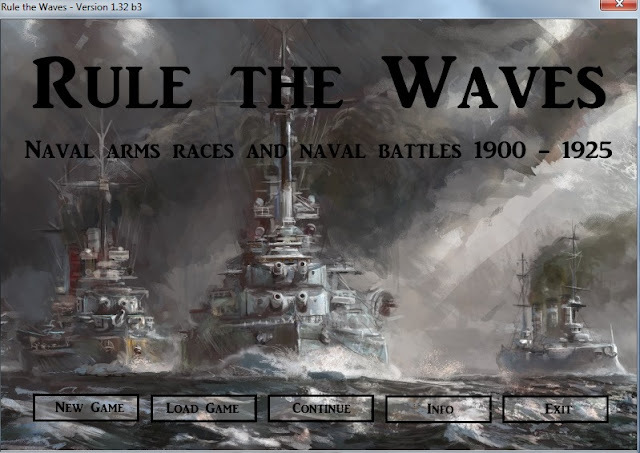 Rule The Waves is not a game, it is a lifestyle. If you want it to be, that is. You can go as deep into this game as you want to. 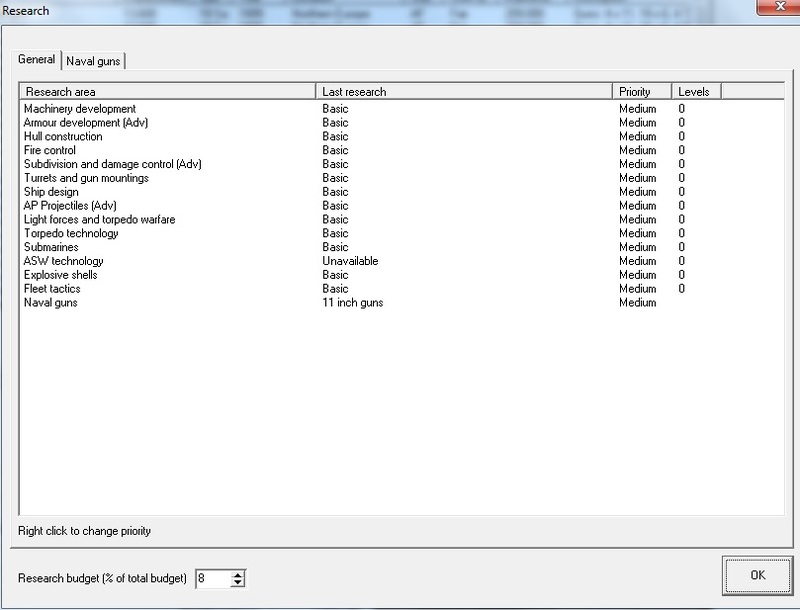 It is almost intimidating when opening up the game. Where to start and what to do? Thankfully NWS has thrown in a lot of help for the budding Tirpitz in you. 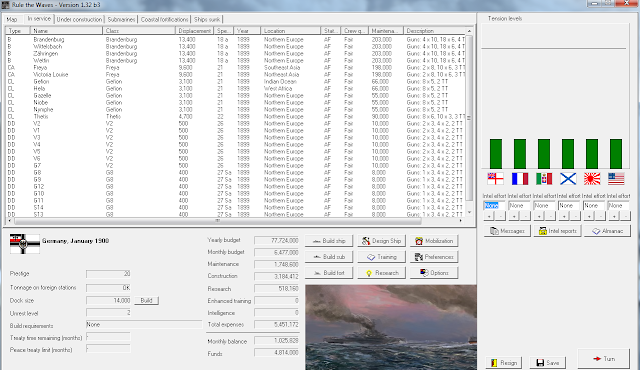 The start of the game is still a few years before the advent of the Dreadnaught changed the entire naval race. The ships you start with resemble those in the Russo-Japanese War, not WWI. England, Germany, France, Italy, Russia, Austria-Hungary, Japan and the US. 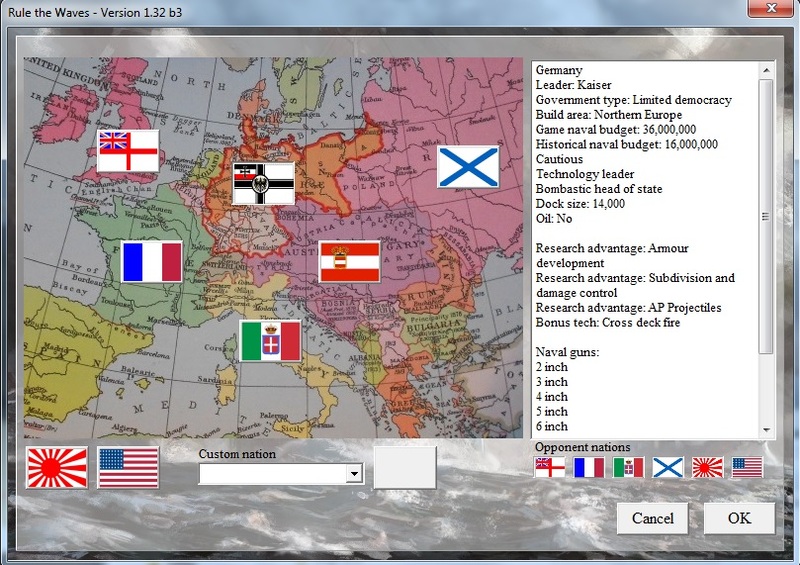 You can also click on 'Custom nation'; this allows you to also pick CSA, CSA2, Spain, Spain2. Each country has its own research advantages, and it also has some disadvantages listed. 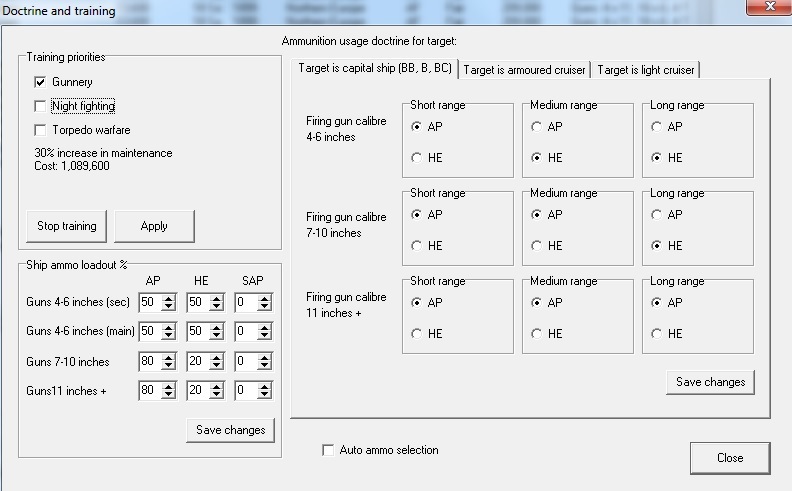 One of the disadvantages is the size of the naval guns your country can build compared to others. 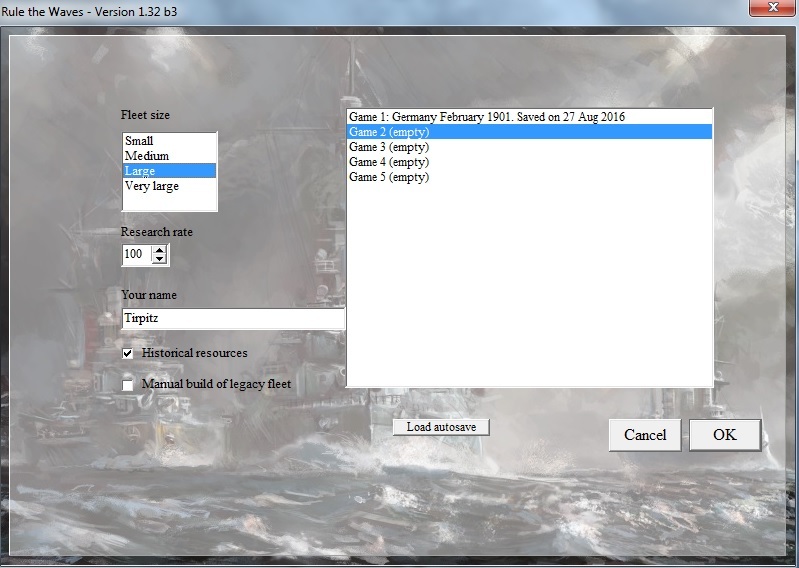 You can choose to use the historical fleets of each nation and its resources, or make it more of a sandbox game and manually build your existing fleet. This doesn't mean you will be able to start churning out Yamatos immediately, though. 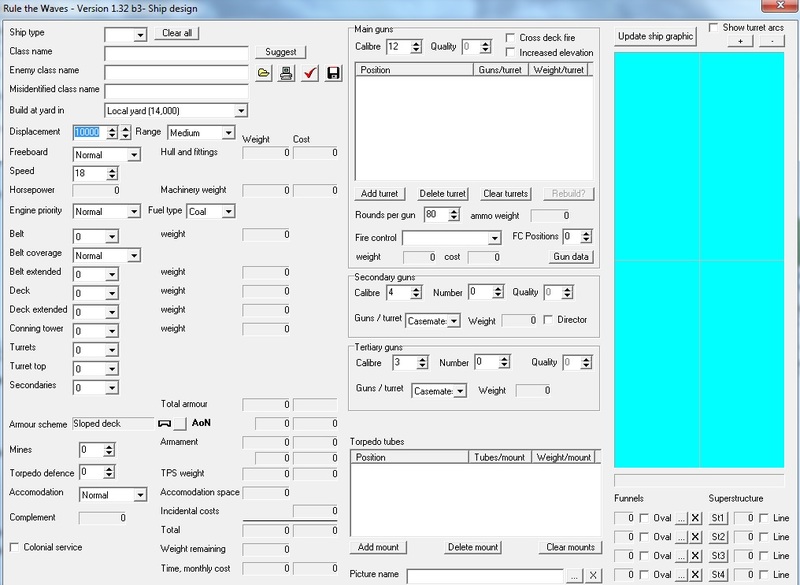 All of your ship's designs will have to be researched, including tonnage and gun size etc. You will also have to make sure that your docks are capable of holding the behemoths you plan to build. The next screen will show you the fleet you built or the historic legacy fleet you own. For the warfare part of the game, it plays out in the same way as their earlier games: Steam and Iron, and the Russo-Japanese War. One thing about the warfare aspect, it does not play out historically. You are leading your country and its naval forces to an all new alternative history. So don't think that you have X numbers of years until World War I starts. You will be dealing with all sorts of provocations and problems that show up on the international political scene. You might have planned to have your navy ready for a war in 1908, and it breaks out in 1906. Just as in your home finances, there is always a price to pay. You have a naval budget to work with. That leads to all sorts of quandaries. 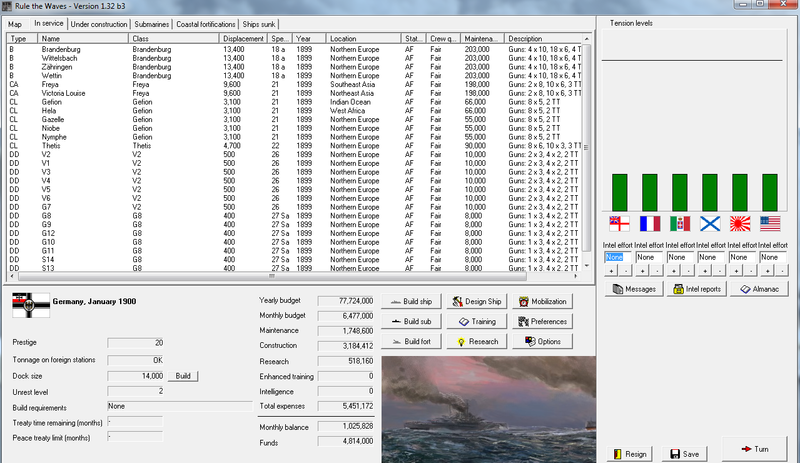 Do you spend your money on your fleet facilities to finally build that battleship you always wanted, or just build more of the ships that you already have the research for? 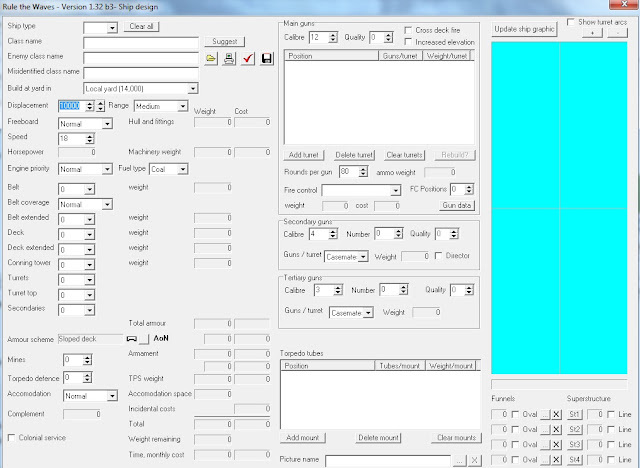 This is the ship design screen where all of us budding Tirpitzes and Fishers will run rampant. Building your ships is also a game of one or the other. Do you build an armored giant with pea shooters or do you build a gun platform made of paper? It's all up to you what ships your navy has to use in its wars. You will also have to build your fleets of submarines and forts. A massive fleet is only as good as the sailors that man it. Training is another piece that fits under the wide brim of your admiral's hat. It's also expensive and needs to be budgeted for. This screen shot shows that I am getting really close to ending up in a war with the US. The 'tension' bars are in yellow, green, and possibly a color you would see in a diaper. Naval actions can take place all over the world. You can end up at war with a nation on the other side of the globe. As naval chief of staff you will also have to direct your countries intelligence efforts against the other powers. You do not want to find out about Britain's game changing battlecruiser as it slides down the slip. 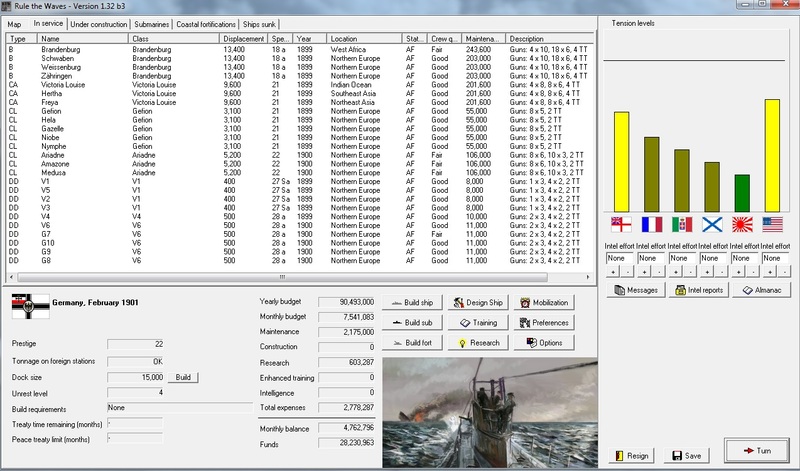 This game has made the naval world of 1900 yours to conquer. How far into the future do plan for your navy? Is it only until the next war breaks out or are you actively searching out the newest torpedoes, and what about the crazy Wright brothers? Do they actually have something that a navy could use at some point in time? The game has endless possibilities for replay. You can try every build or size, and shape navy and ships that you have ever imagined. Some of the ships you start out with will be equipped with rams, and by the time your game is nearing its end, planes will be flying over your forces. For the actual game mechanics of the warfare you will wage, please see my review of Steam and Iron. I wanted to focus on all of the new elements that Rule the Waves brings to the table. 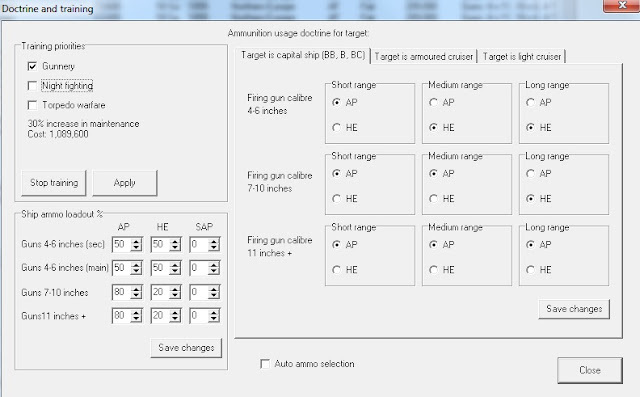 Just as a quick rundown: big gun battles, mines, torpedoes, submarine, and antisubmarine warfare etc. are included. So the game is everything that Steam and Iron was and so much more. For me, whose knees buckle at the site of a triple turret, it is heaven brought to earth in zeroes and ones. We can only hope that NWS can bring WWII naval warfare to life, and to make it as manageable a game as this one. For all of you budding naval enthusiasts out there, here is a question. As a child you saw the 'Sound of Music', and watched a family escape the Nazis. What does that family have to do with this game? Ritter (Baron) Georg von Trapp was a WWI submariner. Also his first wife was Agathe Whitehead, the granddaughter of Robert Whitehead, the inventor of the torpedo. Ding, we have a winner. Although to be quite honest I knew his first wife was English, but I didn't know about the torpedo connection.